On Wednesday, Sept. 12, 2012, at approximately 10:08 a.m., three males entered the Bank of America on the 19000 block of Soledad Canyon Road, Canyon Country, and carried out an armed takeover bank robbery. A fourth suspect was waiting in a getaway car. The suspects fled the location with an unknown amount of money. Deputies and detectives from Santa Clarita Valley Sheriff’s Station quickly located the getaway car and a vehcile pursuit began. During the pursuit, two of the suspects exited the vehicle in two different locations: Yarnell Street/Carol Lane in Sylmar, and Astoria/Foothill Boulevard in Sylmar. The suspect vehicle continued to drive recklessly while throwing cash out of the vehicle in South Los Angeles. The pursuit ended at Vernon Avenue and Kansas Avenue in South Los Angeles, where the two remaining suspects were taken into custody. Out of the two suspects who exited the vehicle in Sylmar, one was apprehended near Yarnell Street/Foothill Boulevard in Sylmar. One of the four suspects remains at large. The pursuit and extremely dangerous actions of the suspects was televised live by many TV stations. At least one of the three suspects arrested is from the South Los Angeles area. The circumstances of the robbery is a joint investigation between Los Angeles County Sheriff’s Department Major Crimes Bureau and Federal Bureau of Investigation agents. Anyone with information regarding this incident, or has knowledge about the recovery of stolen money, is encouraged to contact the Santa Clarita Valley Sheriff’s Station, 661-255-1121. If you prefer to provide information anonymously, you may call “Crime Stoppers” by dialing (800) 222-TIPS (8477), or texting the letters TIPLA plus your tip to CRIMES (274637), or by using the website http://lacrimestoppers.org. Two male suspects have been caught and taken into custody at the end of a pursuit that started after an armed robbery of the Bank of America in Canyon Country. The vehicle pursuit went from Canyon Country on the 14 freeway to the southbound I-5, ending at the intersection of Kansas and Vernon Avenues in southwest Los Angeles, at times reaching speeds up to 100 miles per hour. Once the vehicle was on the I-5, he made two stops; letting out two suspects at Yarnell Street and one at Hubbard in Sylmar before continuing toward downtown Los Angeles. There are currently two active containments to capture the three outstanding suspects; one is at Foothill and Astoria streets in Sylmar and the other is at Hubbard and Excelsior Streets, also in Sylmar. 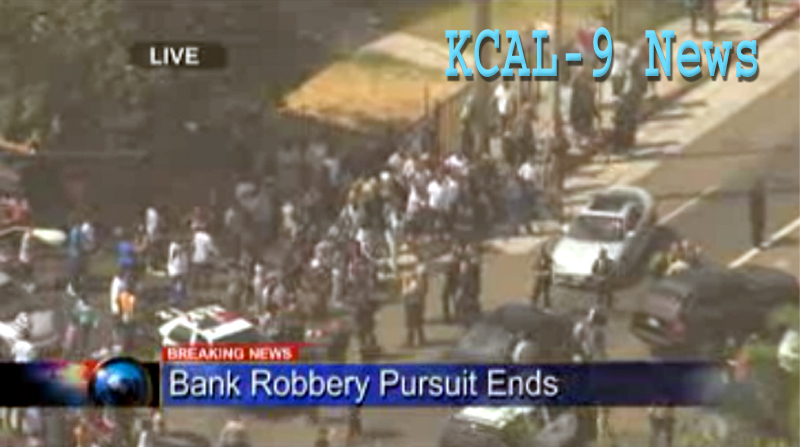 During the pursuit the suspects were seen throwing cash from the vehicle in South Los Angeles. Several residents were spotted running into streets to retrieve the littered cash. Following the arrests a potentially dangerous mob scene developed on Vernon Avenue one block west of Vermont. Additional LAPD units arrived on scene to disburse the crowd. According to Sgt. Dan Stanley of the Santa Clarita Valley station, the armed robbery was reported at 10:03 a.m. Deputies found the suspect vehicle on the 14 freeway and followed in pursuit, observing three suspects getting out of the car. The vehicle pursuit continued into downtown Los Angeles, where the suspects (two are in the vehicle) The suspect vehicle is a black Volvo SUV with two occupants. News cameras have captured shots of the suspects throwing money from the rear windows of the vehicle as it traveled through residential areas. Details available are sketchy, but it is known that there were three suspects who fled the bank in a black Volvo SUV and headed for the 14 freeway. Stanley said that no one was injured during the robbery.